Yes, this is just someone else’s garbage, sitting on a concrete ledge on my block in the East Village. 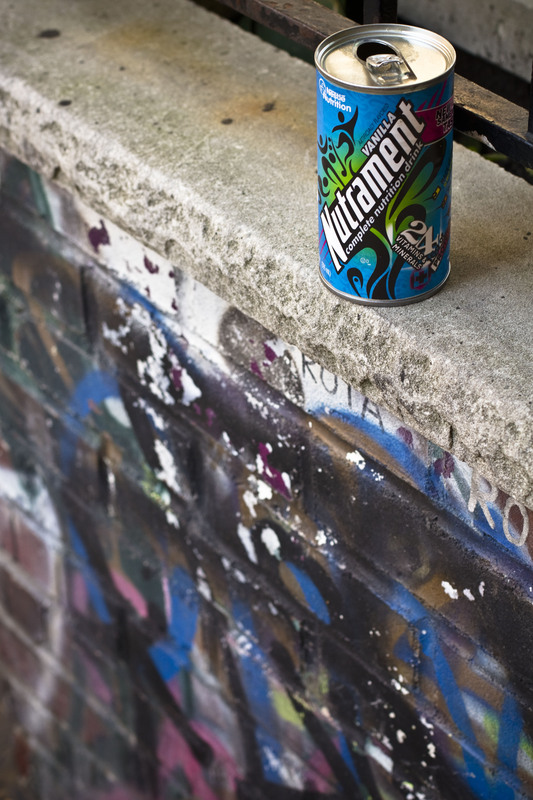 I don’t even know what Nutrament is… but what compelled me to stop and take pictures of this scene, is the way the colors in the graffiti match the colors of the Nutrament can’s design so perfectly. It’s almost as if someone was inspired by the can and created the graffiti right underneath it to match. Do you see what I mean? I thought it was kind of a cool coincidence. Meanwhile, I’m so psyched for this weekend. We have NO plans. Yay. Well, except for a brunch on Monday with friends in Brooklyn. We’re going to Fornino… I used to eat pizza there almost weekly – back in the olden days when I would spend every Friday night at the Brooklyn Brewery in Williamsburg. I haven’t been in years, and this time we’re checking out the Park Slope location. We’re going to eat (not pizza – I think they have a brunch menu), and then we’ll browse around the Park Slope hood a bit. It’s time to get serious about researching Brooklyn neighborhoods as Adam and I are pretty set on moving by next June latest. I’ve read a little of the Guide du Fromage and it’s amazing, but things have been so busy that I haven’t had time to really immerse myself in these books. I’m sure they’re treasure troves of foodie bliss, so I’m looking forward to diving in full force this weekend. What are you all doing this holiday weekend? Any exciting plans?